AMD Opteron 6300/6200/6100 with 4U rackmount black. Memory Voltage - 1.35V or 1.5V. Include Hardware 6Gb SAS2 RAID controller (LSI 9271-4i with cache memory, installed to PCI-e slot) connects 24 SAS2/SATA3 hard disk drives. IPMI 2.0 remote management, IPMI 2.0 with virtual media over LAN and KVM over LAN support . 1 RJ45 Dedicated LAN supports IPMI. 2 PCI-e x4 (in socket x8) slots. 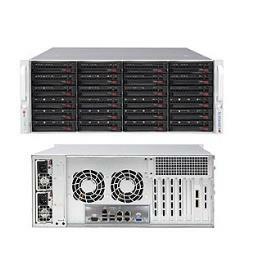 24 of SATA/SAS hot-swap bays, SAS2 RAID card, SAS2 6Gb backplane with SAS2 expander included. Redundant 920W power supply included, Platinum 80+. ** add CPU cooler per processor.